This month’s chapter is noted as the beginning of writer Peter David’s attempt to revitalize the book via a series of surprise twists and turns. Hey, I’m all about upping the ante a bit if it makes for better material, but does that mean he’s conceding that the last few years’ worth of X-Factor was crap? I’m not sure I agree, really. Either way, he’s so convinced you’re going to flip out over the shocking conclusion to this issue that it opens with a “personal plea” in which he begs his readers to resist the urge to go online and share, lest the moment be cheapened for subsequent readers. For what it’s worth, he’s right – the big twist in question is a major dramatic turn that shakes the book to its foundation. I’m still waiting to flip out, though, and I’m not sure I’d have immediately been moved to sign on and spill the beans to anyone who cares to listen (if that isn’t what I’m doing here) but he promised big and, for my money, he delivered. Although it’s a team book at heart, for obvious reasons the spotlight shines a little brighter on Madrox and Siryn than their peers. It couldn’t ask for a better pair of leads – their connection is vibrant and emotional and they play off each other like a traveling act. Peter David spends much of the issue convincing us that they’re just an average couple in love, then suddenly reminding us that in actuality they’re anything but ordinary. A contraction forces Siryn to scream, the force of which shatters the hospital windows. 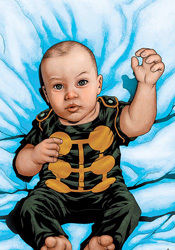 When a nurse takes his child to the nursery, Madrox leaves a clone behind to comfort the new mom. Little touches like those serve the issue well: they keep things from straying too far from the X-Men universe and, surprisingly enough, add a bit of humanity to both characters. David knows these guys inside-out, and that pays dividends each month but he’s also not afraid to rattle the cage for dramatic effect. Valentine De Lando’s artwork is worthwhile, if not especially memorable. His backgrounds are often flat and underdetailed, and his camera angles lack a real visual punch, but he mostly makes up for that with a firm grasp of facial expression and body language. Although he gets some pretty rich material to work with this month, I found his contributions to be universally bland and unmoving. Maybe he’s more at home with lasers firing and mutant powers warming up, because while he’s technically sound, emotionally he just doesn’t bring anything to this issue. You won’t remember this one for the artwork, but chances are that isn’t why you were buying it in the first place. As the first in a long line of proposed shakeups, X-Factor #39 gets things started on the right foot with a risky, unexpected twist. The issue switches into slow motion just afterwards, which serves to initially soften the blow, but a few minutes after I finished it, the weight of the situation really began to sink in. If the goal was to hook new readers, mission accomplished - I’ll be tuning in next month to see where things go from here. This is great, imaginative, character-driven drama from an old master, and I’m suggesting you buy it.